Barr's Milkvetch is endemic to southwestern South Dakota, northeastern Wyoming, Nebraska and southeastern Montana. In Montana, it is known from numerous watersheds, several of which contain large, expansive populations. The habitat occupied by this species is not typically suitable for grazing, and the location of its habitat makes it less vulnerable to all but large-scale developments. Proposed resource extraction in southeast Montana may eventually impact the species. Invasive weeds have the potential to be a threat but currently are not posing problems to the species. CommentDeclines in populations have been observed at some sites particularly following drought years though it is unknown if these are simply cyclical fluctuations or have resulted in longer-term downward trends. More comprehensive monitoring data are needed. CommentResource development in several drainages may impact some populations and associated habitat. Weed invasion has also been identified as threat to some populations. Score 6 to 8 total points scored out of a possible 19. Barr's Milkvetch is a perennial that grows in low, dense mats. Leaves have 3 narrowly lance-shaped leaflets and are 1-4 cm long, densely covered with short white hairs. Stipules at the leaf bases are membranous. Purple or pinkish-purple flowers that are shaped like pea flowers are borne in a narrow, open, few-flowered inflorescence. The petals are 7-17 mm long. The calyx is 3-5 mm long and densely covered with long, white hairs. The sparsely white, hairy pod is narrowly elliptical, 4-8 mm long, and 1-2 mm in diameter. In Montana, Barr's milkvetch blooms from late April to mid-June and forms pods in late May and June. Barr's milkvetch is distinguished by its small, iridescent, bluish-purple to bluish-pink, early-blooming flowers. Petal color may fade, sometimes to yellowish-white, as flowers dry (Taylor and Caners 2002). Flowers are necessary to distinguish A. barrii from four other matt-forming, 3-leafleted Astragalus species that overlap geographically with it in Montana: A. aretioides (Sweetwater milkvetch), A. sericoleucus (silky milkvetch), A. gilviflorus (plains milkvetch) and A. hyalinus (summer milkvetch). Flowers or their remnants are necessary to distinguish Barr's milkvetch from co-occurring species of Astragalus that have compound leaves with three leaflets and a cushion-forming habit. The flowers of A. aretioides (Sweetwater milkvetch) and A. sericoleucus (silky milkvetch) are typically one-half the size of A. barrii, and the plants tend to grow in denser mats. A. gilviflorus (plains milkvetch) and A. hyalinus (summer milkvetch) typically have larger, cream to whitish flowers, a longer calyx tube (6-16 mm), and shorter peduncles (0-3.5 mm). Regional endemic, known from the southwestern South Dakota, northeastern Wyoming, southeastern Montana and Nebraska. In Montana, Barr's milkvetch occurs on sparsely vegetated knobs and buttes, usually with dry, fine-textured, often calcareous soils (Vanderhorst et al. 1998). These habitats are characterized by a scattered ponderosa pine and Rocky Mountain juniper, or often just a sparse shrub cover of big sagebrush (Artemisia tridentata) and/or shadscale (Atriplex confertifolia). In southeastern Montana, common dominants or associates are western wheatgrass (Pascopyrum smithii or Agropyron smithii), thickspike wheatgrass (Elymus lanceolatus or Agropyron dasystachyum), green needlegrass (Nassella viridula or Stipa viridula), little bluestem (Schizachyrium scoparium), bluebunch wheatgrass (Pseudoroegneria spicata or Agropyron spicatum), prairie junegrass (Koeleria macrantha or Koeleria cristata), native legumes, Nuttall's saltbush (Atriplex gardneri) and winterfat (Krascheninnikovia lanata or Ceratoides lanata) (Heidel & Marriott 1996). This species often grows along rivers or streams, where downcutting has exposed shale and siltstone crops. Individual populations are frequently confined to specific soil types and rock formations. The largest populations are on silty soils of the Midway series, representing calcareous, platy, soft shale with a montmorillonitic clay component. Populations occur on all slope aspects; however, populations in areas without overstory vegetation tend more often to be on northern aspects, and thus receive shade during portions of the day (Schassberger 1990). Barr's milkvetch is associated with the harsh edaphic and environmental conditions of Badlands areas (Heidel and Marriott 1996). These habitats receive limited rainfall and are subject to high light intensities, potentially limiting plant establishment and survival as a result of high soil water evaporation. Barr's milkvetch often occurs on barren, eroded microsites, and may depend on the climate that maintains these sites to limit competition from other species. At some locations, particularly on steep slopes, soils erode during intense rainstorms. However, because of its cushion habit and dense foliage, the soil beneath Barr's milkvetch plants is protected from this erosion, resulting in plants that are frequently perched atop small pedestals of soil (Heidel and Marriott 1996). This species may remain in a vegetative condition under stressful conditions. Drought conditions in 1987 and 1988 resulted in large decreases in the species' abundance, especially at lower elevations, in lower precipitation zones and on more exposed sites (Heidel and Marriott 1996). This may be a common cyclical trend. It does, however, indicate that populations may respond negatively to a long-term warmer, dryer climatic shift. Populations in the Custer National Forest occur in habitats that receive more moisture than in surrounding areas and are thus more successionally advanced (Schassberger 1990). In these areas, mats of Barr's milkvetch have been noted as larger and often vegetative. This may reflect a different age-class distribution, with these populations consisting of larger, older mats that have lower rates of flowering and fruiting, and reduced seedling establishment. Based on its low, tufted growth form, early-season flowering, and frequent occurrence on secondary range, Barr's milkvetch is probably not affected very much by grazing, unless livestock developments are placed near populations. This species occupies high knobs and outcrops that are seldom selected as development sites. However these habitats could be vulnerable to large-scale disruption of native vegetation and competition from invasives plants, such as yellow sweetclover (Melilotus officinalis). Barneby, R. C. 1956. Pugillus Astragalorum XIX: Notes On A. Sericoleucus Gray and Its Immediate Relatives. Amer. Midl. Nat. 55: 504-507. Barneby, R.C. 1964. Atlas of North American Astragalus. 2 Vols. New York Botanical Garden, Bronx, New York. 1188 pp. Heidel, B.L. and H. Marriott. 1996. Sensitive plant species survey of the Ashland District, Custer National Forest, Powder River and Rosebud Counties, Montana. Unpublished report to the U.S. Forest Service. Montana Natural Heritage Program, Helena, Montana. 94 pp. plus appendices. Schassberger, L.A. 1988. Status review of Astragalus barrii, USDA Forest Service, Region 1, Custer National Forest. Unpublished report. Montana Natural Heritage Program, Helena, MT 61 pp. Schassberger, L.A. 1990. Report on the conservation status of Astragalus barrii: a candidate threatened species. Montana Natural Heritage Program. Helena, MT. 86 PP. Taylor, A. and R. Caners. 2002. Baseline Survey for Astragalus barrii Barneby (Barr's milkvetch) and Physaria didymocarpa var. lanata A. Nels. (woolly twinpod) in eastern Big Horn and southwestern Rosebud Counties, Montana. Montana Natural Heritage Program, Helena, Montana. 27 pp. Vanderhorst, J.P., S.V. Cooper, and B.L. Heidel. 1998. 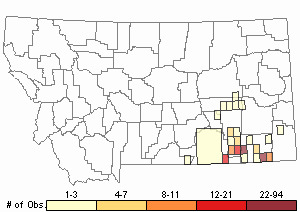 Botanical and vegetation survey of Carter County, Montana. Unpublished report prepared for the Bureau of Land Management. Montana Natural Heritage Program, Helena. 116 pp. + app. Web Search Engines for Articles on "Barr's Milkvetch"